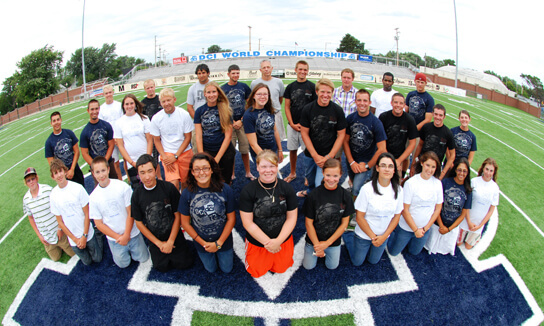 With a declaration by the mayor, the 2009 Drum Corps International World Championships officially began on Monday outside of Ames Field in Michigan City, Ind. That declaration, from Michigan City Mayor Chuck Oberlie, came at the end of the second-annual opening ceremonies, where corps, community members and area music students came together to celebrate the kickoff of what will surely be an exciting week of events. The Michigan City High School Junior ROTC started off the festivities with a Parade of Flags, which was followed by a performance of the National Anthem by the Michigan City High School Marching Band Brass Ensemble. 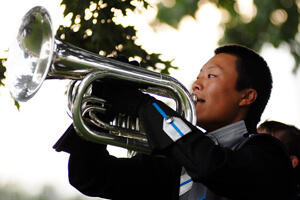 "Michigan City has a 49 year history [hosting] drum corps shows, so if you're a judge, you should be aware that we are very educated and we're going to boo some of your decisions tomorrow," he joked, garnering a laugh from the crowd of more than 100 people. "But realistically, we understand the talent, the time, dedication and hard work they put in, and we appreciate that they share those talents with us in this exhibit here tomorrow." 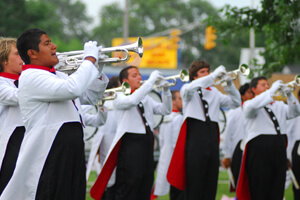 On the eve of the Open Class Quarterfinals competition that will be held in Michigan City on Tuesday, Oberlie wished the competing corps the best of success and told them that his desire was for them to have their best performances of the year the next day. DCI Executive Director Dan Acheson was also in attendance to deliver remarks at the ceremony. "We are honored to be a part of the community here, albeit for only a few days," he said, thanking the citizens of the northern Indiana town for embracing the corps. Corps members and enthusiasts were treated to a small preview of tomorrow's Open Class Quarterfinals event with standstill performances from Legends and Velvet Knights. Kalamazoo-based Legends wowed the crowd with a performance of their 2009 show, "Incrementum," featuring the music of "Daphnis et Chloe" by Maurice Ravel. The Velvet Knights, from Pasadena, continued the fun with their show, "Cirque D' VK…Lions, Tigers and SHARK!! Oh, My…"—a performance complete with clown noses, a tutu, a flying shark, and a potted palm tree looking on as a small piece of the corps' California home. Before the opening ceremonies began, drum majors and directors from each of the corps had a chance to mingle and enjoy pizza at an informal reception outside the stadium. Hall of Fame Leadership Activities Coordinator Gene Monterastelli said the purpose of the event was to give the drum majors, who have a lot of responsibilities, a chance to get together with friends, have a good time and relax for a moment before engrossing themselves in the heat of competition. The Open Class drum majors gather after the reception for a photo opportunty. 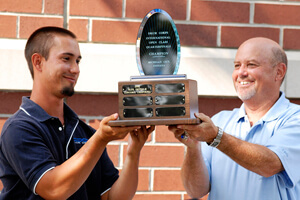 Members of the city's local organizing committee unveiled the object of a new tradition at the reception—the Michigan City Quarterfinals Champion trophy. Made of walnut with an acrylic topper, the trophy will be awarded to the corps that wins the Open Class Quarterfinals competition, regardless of who wins the overall World Championship title, for all 10 years that the event will be held in Michigan City. It was presented to Blue Devils B director Rick Odello whose corps won the Quarterfinals event in 2008. The traveling trophy will head to Indianapolis later this week where it will be displayed at the DCI corporate headquarters, and then it will head back to Michigan City in the spring for the community to enjoy until the World Championships come again. "We wanted something that had a Michigan City connection because we're going to be here 10 years," Mike Pease, local organizing committee chair, said about the trophy. "It was a lot of fun planning it, and we knew everyone would like it and appreciate that we're honoring the Open Class corps." The reception, sponsored by the Hall of Fame committee, Jim Jones Leadership committee and mayor of Michigan City, is in its inaugural year, and drum majors said they really enjoyed the event. "It's been a lot of fun getting to know other drum majors and seeing the similarities and differences between the corps," said Velvet Knights drum major Dan Phillips. "We all joke about getting everybody up in the morning and putting them to bed, how frustrating they can be at times, but at the same time how much they can surprise you with what they can pull off. It's really encouraging...and the pizza was fantastic." "Legends drum major John Pinkster agreed, saying, "This experience was a lot of fun, getting to talk to a lot of other drum majors and noticing that what we do everyday is basically the exact same thing. We're all basically teenagers having fun and doing what we love." All four drum majors for Velvet Knights and Legends agreed that it was an honor to be heralding the start of the World Championships in the ceremony. Pinkster said the progress the Open Class corps are making astonishes him. "What's amazing to me is how in the last two weeks, everyone's scores shoot up exponentially. The learning curve just jumps. Everyone understands why they're here, what they're doing, and they've figured out the summer tour. Now it's the last four days of hurry, hurry, let's go, and everyone's adrenaline gets going and it's a big push to see what you can accomplish."